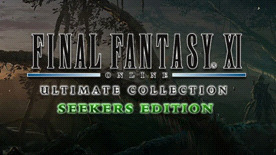 FINAL FANTASY XI Seekers Edition brings together all of the greatest FINAL FANTASY XI online role-playing expansions combined into one amazing package for you and your friends to enjoy. Enter an online multiplayer RPG that challenges players to journey through the world of Vana´diel® — a world of fantasy, adventure, and exploration. Heed the call and join players from around the world to become the hero that Vana´diel needs. Discover new creatures, pioneer wild lands, and conquer quests on your daring journey! With all five installments included your world will be filled with endless possibilities. Chocobo Shirt: This new body piece adds a bit of flair with its chocobo inspired choker and design! The chocobo shirt pairs perfectly with the Destrier Beret to make early adventuring even more efficient! Destrier Beret: This adorable hat is filled with stats to aid adventurers just that are starting out! The beret is also a great fashion statement to demonstrate your appreciation for Vana´diel´s trusty steeds. FINAL FANTASY XI © 2002-2013 SQUARE ENIX CO., LTD. All Rights Reserved. CHAINS OF PROMATHIA, A CRYSTALLINE PROPHECY, EVIL IN SMALL DOSES, HEROES OF ABYSSEA, THE LEGEND TORN, HER EMPIRE BORN, A MOOGLE KUPO D’ETAT, ODE OF LIFE BESTOWING, PLAYONLINE, the PLAYONLINE logo, RISE OF THE ZILART, SEEKERS OF ADOULIN, SCARS OF ABYSSEA, A SHANTOTTO ASCENSION, TREASURES OF AHT URHGAN, VANA’DIEL, VISION OF ABYSSEA, WINGS OF THE GODDESS are registered trademarks or trademarks of Square Enix Co., Ltd. FINAL FANTASY, SQUARE ENIX and the SQUARE ENIX logo are registered trademarks or trademarks of Square Enix Holding Co., Ltd. ILLUSTRATION: KENICHIRO TOMIYASU. From the 8th July 2014 the game is available in English only.